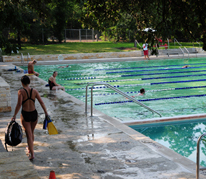 Deep Eddy Pool is a Regional Aquatic Center located at 401 Deep Eddy Drive in Austin, Texas. View all City of Austin pools and splash pads. CLOSED March 25th - April 7th for spring cleaning.